The global bond rout accelerated overnight, when Japan surprised the market - which had been already on edge over the BOJ's tightening intentions - with an announcement to further "stealth taper" its QE by trimming its buying of bonds due in more than 25 years by 10 billion yen ($88.9 million), from 60 to 50 billion yen at its regular operation on Friday, the bank's first reduction in the segment since July. 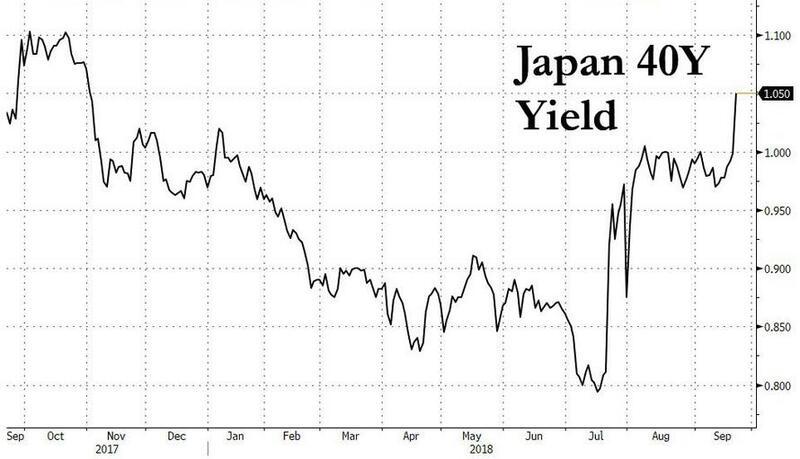 The move was most pronounced among the longest duration Japanese bonds, as 30-year JGB yields rose 4bps to 0.89% hitting the highest level since October, while 40-year broke 1% level, rising as much as 4.5bps, and the highest since November. Futures volumes were running 200% of 10-day average through morning trade. The "super-long" sector for Japanese bonds is favored by institutional investors, and especially pension funds who are seen as major buyers of 40-year debt, life insurers are among the largest holders of 20- and 30-year zones. And as Bloomberg notes, the 1 percent level for the super-long zones is seen as critical in prompting these long-term investors to shift some money back into the yen from higher-yielding overseas debt. The 30-year yield rose four basis points to 0.89 percent, while that on 20-year debt increased 2.5 basis points to 0.645 percent. JGB volatility spiked in July after the BOJ said it would tolerate a wider band of fluctuations in the benchmark yield and allow more flexibility in bond operations, allowing the 10Y yield to rise as high as 0.20% in an attempt to steepen the yield curve and provide some comfort for struggling local banks, even as it continues to push forward with its extraordinary monetary easing. On July 31, the BOJ said that it will allow the 10-year yield to deviate by as much as 0.2% points around zero percent. Earlier this week, governor Kuroda on Wednesday kept the BOJ’s monetary policy unchanged and reaffirmed its commitment to reaching 2 percent inflation. Meanwhile, the re-election as party leader of PM Abe - who appointed Kuroda to head the BOJ in 2013 - will ultimately serve as an endorsement of his mix of monetary easing, regulatory reform and fiscal flexibility. 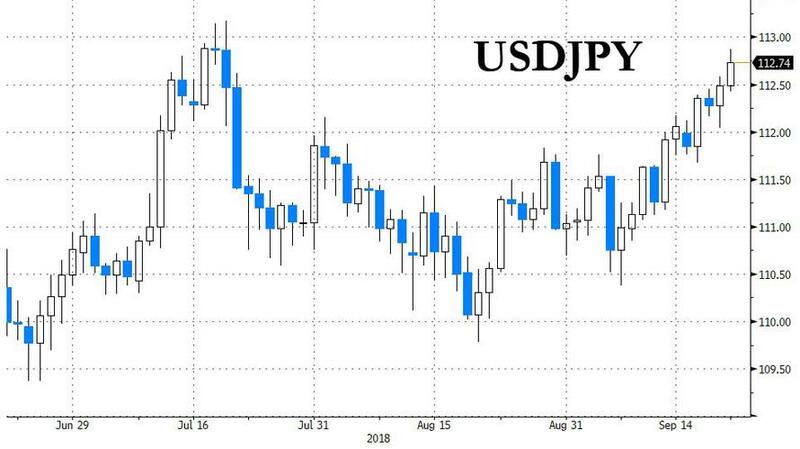 Yet even with the de facto tightening, the Japanese yen ignored Friday’s tapering move, dropping to a two-month low versus the dollar and the USDJPY rising as high as 112.87, as the Topix index rallied to the highest level since May in the footsteps of the furious rally that has gripped global stocks in recent days. Commenting on the move, Mitsubishi UFJ's Naomi Muguruma said that "the BOJ’s action is in line with the policy of conducting market operations more flexibly and is aimed at improving market activity, not at raising yield levels. The move also comes in light of a supply/demand balance as government bond issuance in the super-long zone is reduced this year." The rise in Japanese yields joined a global selloff in U.S. Treasuries, which overnight traded at 3.08% - one of the highest levels in recent years - and German bunds, ahead of another interest-rate hike by the Federal Reserve next week. The European Central Bank this month confirmed it will cut bond-buying in half next month and anticipates that new purchases will be halted by the end of the year. While Friday’s surprising announcement will bolster speculation that the BOJ is seeking to intentionally guide yields higher, many investors do not see the advance in Japanese yields sustaining as they see authorities carrying on with the ultra-loose monetary policy indefinitely, after Prime Minister Shinzo Abe’s winning his third straight three-year term as head of the ruling Liberal Democratic Party on Thursday took him a step closer to becoming the country’s longest-serving premier. 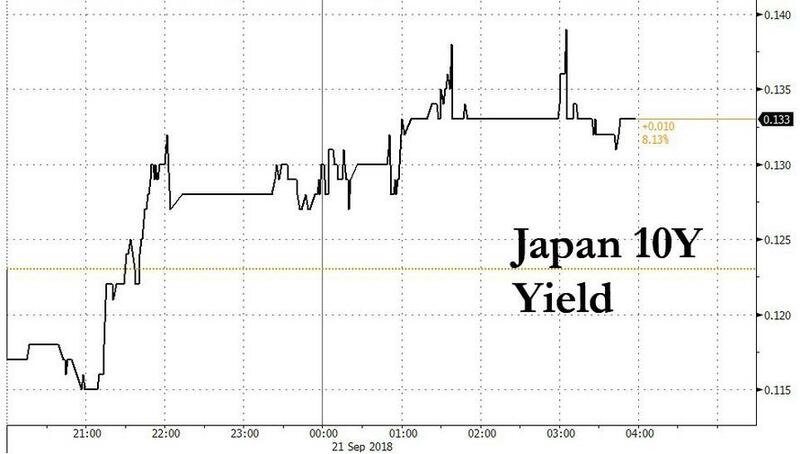 "The BOJ’s move Friday confirmed market views that it will continue to gradually reduce buying in super-long maturities as it looks sustain its easy policy for a while with Abe government continuing,” said Akio Kato of Mitsubishi UFJ Kokusai Asset Management in Tokyo. "The longer-yields have reacted but their moves are contained within the levels of steepening anticipated under the BOJ’s latest tweaks." In an attempt to encourage curve steepening, earlier in the month the central bank raised purchases of short-tenor notes this month to offset a cut in frequency of operations for those maturities. Still some said this may be too much ado about nothing: “We shouldn’t read too much into each operation as it is conducted within the policy mandate” of being more flexible, said Muguruma of Mitsubishi UFJ.